Sony's PlayStation 4 Slim comes with a sleek, single tone matte finish. Our mounts give your PS4 Slim & controllers an amazing free floating look. Our HIDEit 4S design uses both the center channel of the PS4 Slim and Sony's own secure mounting mechanism built into the PS4 Pro; a small screw secures the mount to the device so there is no way for the PlayStation to fall or slide out. 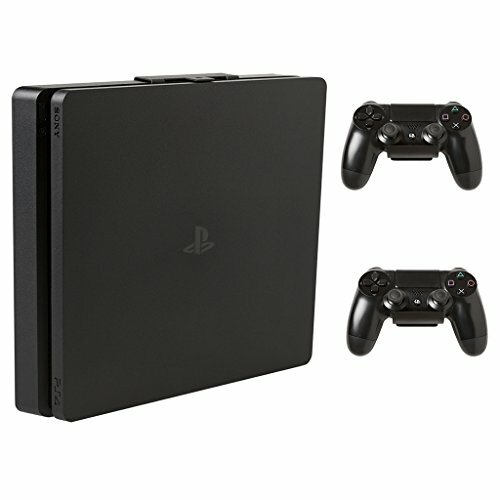 You can choose to VESA or wall mount your PS4 and have it mounted in minutes. As with all our Gaming Mounts, our design does not obstruct ventilation. For durability we use powder-coated 16-gauge steel for this bundle. These mounts are built to last. Happy Gaming! Openings allow full access to power port, digital out port, and all vents. Position for disk access on right or left side. Made in the USA from Recycled & Imported Steel. Powder coat finish prevents rust & won't chip. Uni-C hook shaped design works with nearly any controller. Includes M4 and M6 VESA screws, Sony Securing Mechanism screw, drywall screws and anchors. Stud mounting is optional. *** Please VESA Mount with Caution. HIDEit Mounts is not responsible for TV stand weight distribution hazards associated with VESA mounting. WALL MOUNT AND PROTECT YOUR PS4 SLIM AND CONTROLLERS. The HIDEit 4S Mount keeps your Slim PS4 safe from accidental damage from falls, spills, kids, and pets. Controller Mounts keep your setup organized. FLUSH MOUNT DESIGN. Patent Pending design secures PS4 Slim using Sony's Secure Mounting Mechanism built directly into the console! Controller Mounts make it easy to charge your controllers from the console. Form fit and countersunk holes create a flush installation. STEEL FOR ULTIMATE STRENGTH. Like your TV Mount, the HIDEit 4S and controller mounts are made from heavy-gauge, cold-rolled steel for strength you can trust. Powder-coat finish won't rust or chip. KEEPS YOUR PS4 SLIM COOL. Vent openings are left completely unobstructed. Unlike most media cabinets and TV stands, your HIDEit Mount won't trap heat keeping your gaming system cool. If you have any questions about this product by HIDEit Mounts, contact us by completing and submitting the form below. If you are looking for a specif part number, please include it with your message.